The tram is great fun for children, too, and much easier than buses which can be long, slow and boring. I know I don’t only speak for myself when is say that the tram is so much better for getting around with children in Sheffield than using a bus. 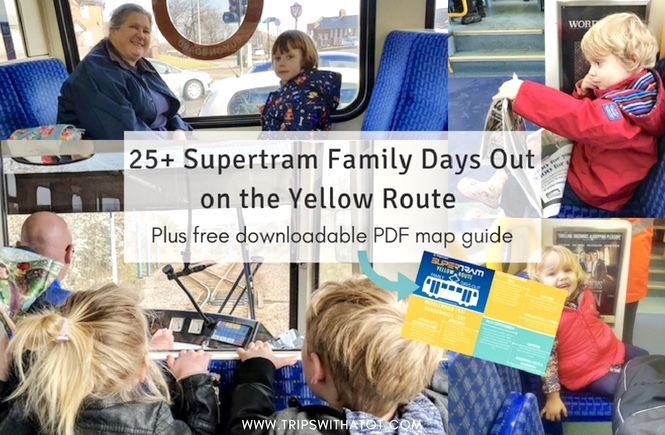 With this in mind, I thought I would put together a list of some fantastic days out and fun places to go for families in Sheffield using on the super tram. I’ve decided to split this into each route to make it easier for you. 🙂 And, you might be surprised how much you can do (and for free/cheap, too!). I have a freebie for you! 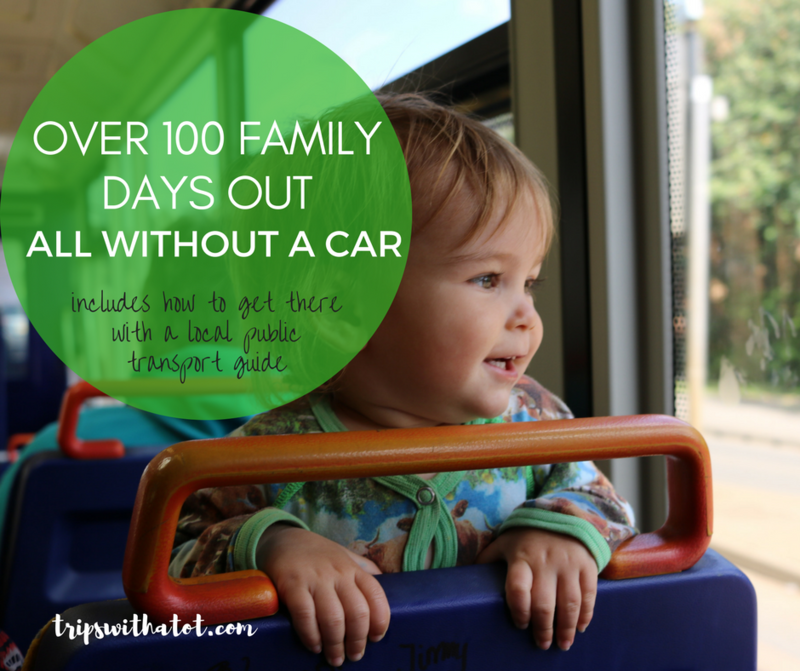 This free yellow route family days out infographic has been created for you to use. I hope it helps you plan your days out on the Supertram. Below is a preview of this PDF file, you are welcome to save it an as image however I urge you to download the complete FREE PDF infographic to enjoy it in full resolution. This will be sent straight to your inbox. Simply click here to get the guide and enjoy! Middlewood (S6) – Meadowhall (S9). This is a great line for days out on the tram! There’s so much to do just on this route. Let’s start from Middlewood terminus. This is in S6, near Hillsborough. From here you can catch the Supertram link (SL1 and SL1A) up to Stocksbridge and Deeper, which connect the villages to the rest of the Supertram network. In Stockbridge you’ll find Fox Valley; a lovely little shopping village with cafes, restaurants and events. Middlewood Park has a nice little playground and from there you can have a walk to Beeley Woods and Oughtibridge. From Middlewood into Hillsborough along Middlewood Road is a good place to stop for an explore at Hillsborough Park and Walled Garden. Get this free trail for 10 things to see and find. There’s a library, a variety of shops, soft play centre, cafes, shopping centre, pubs, etc.,. There’s a lovely community centre at Burton Street with Tippy Toes playgroup on Friday mornings. You might want to stop at Infirmary Road for a big Tesco, supermarkets, Zest Library and community centre and a stroll up to Ponderosa park. Only 10-15 minute stroll away is a new, big and adventurous indoor play centre Medieval Mayhem. It’s at Shalesmoor where you’ll find Kelham Island, an industrial quarter of Sheffield with a fantastic museum… Kelham Island Museum is a must and it’s great for all ages. Read our review here. Every month, Peddler Night Market is on at Burton Road in Kelham Island and very cool; watch our video from the last one here to see what it’s all about. Kelham island is a very up and coming area in Sheffield with new cafes, bars and apartments. It’s a great place for the Sheffield Ale Trail. It’s not a far stroll from the city centre, too, and the Nichols Building is worth a visit on your way in for all your retro/vintage needs. It’s a far walk from another great museum at West Bar: National Emergency Services Museum. From Shalesmoor the tram turns upwards to go into town, stopping just before city centre at Sheffield University where you can get off for a 10minute walk up to Weston Park Museum. This museum is one of the best things to do in Sheffield for kids and you must definitely go. Take a stroll around the park and don’t forget Crookes Valley Park just behind the museum for a good playground. Let’s go back to the tram stop, however! Don’t forget to visit the Sheffield University Students Union with a great shop, places to eat (good vegan options) and a zero waste shop. You don’t need to be a student to go to any of these places. West Street is a good location for getting off for Sheffield City Centre and from here you can go just about everywhere. At West Street there’s good places to eat, head to West One for family friendly restaurants such as Las Iguanas (and great places for cocktails!). One of my favourite places to play in the city centre you can find just behind West One plaza; Gell Street playground. We always head to this one if we’re in town and Eric loves it! From West One you could stop for a picnic on Devonshire Street and watch the skaters. If you’re getting off at City Hall rather than Cathedral, you can cut down the side streets to Barkers Pool which always has a good atmosphere. There’s John Lewis, always a popular cafe with families and good baby change, and you could picnic on the City Hall steps. Just next to the City Hall is a small green which you may walk past, but you can go inside there and look at a few animal sculptures. There are benches for a picnic, too. West Street, City Hall, Cathedral, Castle Square and Ponds Forge are all tram stops which run directly though the city centre, so really any of these stops are perfect for getting off to go shopping or exploring. I would get off at Cathedral for Fargate with shops, coffee shops and upto Peace Gardens. 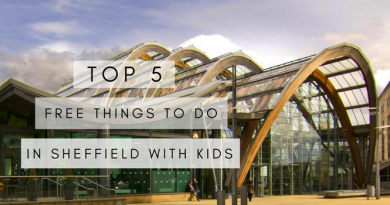 There’s so many things to do in Sheffield City Centre, you really need to read this guide on Top Things To Do in Sheffield City Centre to find out all the great places. My favourites being Winter Gardens, Peace Gardens and the Sheffield Central Library. Ponds Forge International Sports Centre is a fantastic place for family swim, leisure and sport activities. I really recommend the leisure pool for the separate toddler area. In the same building is a cafe. From this area you could try Norfolk Heritage Trail starting at Park Hill. You could stroll down to Victoria Quays, too, for a canal stroll. After many stops through the city centre, alight at Hyde Park for Victoria Quays; for a stroll from Victoria Quays along the canal, and Megakidz play centre. From Cricket Inn Road, the tram goes along Tinsley Canal Basin where you could get off for a walk to Don Valley and/or Centertainment. At Don Valley Stadium is Sheffield Olympic Legacy Park, and you might not know about the 100m marked running track or Don Valley Bowl loop; find out more about that here. The Olympic Legacy Park is currently being renovated into a 35 acre site for world class sports, leisure, education and health. Find the English Institute of Sport, IceSheffield, Sheffield Arena and many more venues. For eating, drinking, bowling, cinema and more family fun head to Valley Centertainment. A good variety of family friendly restaurants to choose from such as Pizza Express, Nando’s and Bella Italia. Kids will love Monkey Bizness Indoor Play Centre which is one of our favourites, in the same building as Paradise Island mini golf and Laser Quest. Hollywood Bowl has a restaurant/bar, arcades inside and is my favourite place to bowl. The IMAX Cineworld is a huge with a Starbucks coffee inside which makes a perfect pit stop. Who doesn’t love IKEA?! New IKEA Sheffield is at Carbrook tram stop. Join the free family club to get an IKEA Family card for discounts and free drinks in the cafe. Very family friendly place to shop, eat and browse. Free creche and toys to play with in the children’s section. Two tram stops for the big shopping centre Meadowhall. Shop, eat, drink and more. Alight at Meadowhall South for Jump INC Trampolining (great toddler sessions) and Debenhams entrance at Meadowhall. Meadowhall’s main tram stop has a train station. Thank you for reading, I hope you found this useful and if you did, please could you share it with your family and friends?